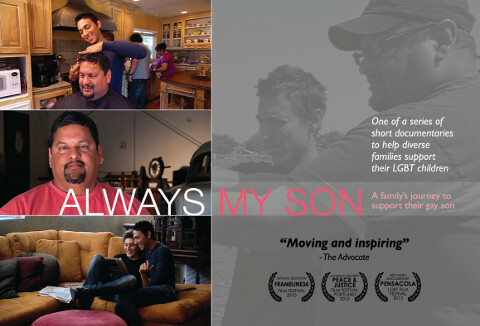 Helping diverse families to learn how to support their lesbian, gay, bisexual, and transgender (LGBT) children takes resources that touch the heart – like this trailer for our new film, "Families Are Forever" or our earlier film, "Always My Son." We're raising funds to produce a series of these short documentaries that show the journey from struggle to support of ethnically and religiously diverse families with LGBT children. These videos are informed by our years of research and work to help diverse families support their LGBT children. Watch our films, read our family education materials and research publications. These videos – and the others we want to make – include family accepting and rejecting behaviors that our research shows contribute to serious health risks like suicide, substance abuse and HIV, or that promote overall health and well-being. Family rejection increases family conflict that can lead to homelessness and placement in foster care and juvenile justice facilities. And family acceptance increases family connectedness and contributes to wellness, self-esteem, and a positive sense of the future for LGBT youth. We use these videos in our work to educate and support diverse families with LGBT children to help prevent and decrease rejecting behaviors that our research shows contribute to high levels of risk, and to help families to support their LGBT children in the context of their cultures and religious values. We also use them to train health and mental health providers and clergy, to help providers understand the critical role of families in supporting their LGBT children and to humanize the lives of LGBT children and families from very diverse backgrounds. Families are Forever was selected to screen in more than 50 film festivals from Ireland to Rio de Janeiro and in communities across the U.S. The film has received 20 awards from diverse film festivals, ranging from Mumbai, India to Outfest in Los Angeles and the Tree of Life Award from Affirmation - the international LGBT Mormon organization. The Educational Versions of "Families Are Forever" and "Always My Son" that are licensed for educational use outside the home for education and training in public settings, classrooms, congregations and communities will be available soon. Help us tell these stories of diverse families with LGBT children. These stories of transformation, hope and love that show how very diverse families integrate deeply held religious and personal values with love for their LGBT children — have not been told… until now. Help us make a difference for LGBT children, youth and families. To give LGBT youth and families hope, to decrease isolation and to show how families learn to support their LGBT children. To help prevent health risks, including depression, suicide, substance abuse, HIV and homelessness, and to promote self-esteem, health and well-being by helping families to decrease rejection and increase support for their LGBT children. For education and counseling with LGBT children, youth and families by school counselors, social workers, psychologists, nurses, pediatricians and religious leaders and for family service workers and parent advocates to help families understand the relationship between family reactions to their LGBT children and their children's risk and well-being. For training in medical schools, nursing, social work, psychology and other professional training programs to help providers understand the journey to family acceptance, and how specific family attitudes and behaviors affect their LGBT children’s health and mental health. To educate the general public and to humanize the lives of ethnically and religiously diverse LGBT young people and their families.